Bon Jour! And just what a good day it is when you walk through the front door of this French café delight! The classic Provencal colors of warm yellow and blue delight the eye while the nose is already savoring the fragrance of warm pastries and savory entrees being made from scratch in the back kitchen. 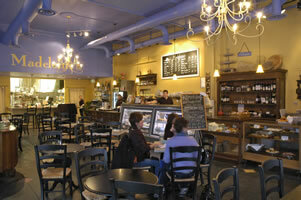 Madeleine's Café & Pâtisserie offers a superb taste of rustic French fare, right on main street Spokane. Created and chefed by a talented mother daughter duo, the specialty is French pastry with a daily fresh offering of croissants, éclairs, tartlets, napoleons and brioche as well as a variety of tasty cookies. Come lunch the counter is busy with orders for steaming bowls of savory soup, crab tartlets, quiche Lorraine, panini sandwiches or a variety of French salads. Specialties like vol-au-vents, herb roasted chicken potpie or the lasagna of the day make the right choice a difficult task. Mon dieu! For heartier Provencal fare try the daily and weekend specials of classic French dishes such as coq au vin, beouf en daube, honey rosemary butter salmon, lamb stew or the mini sliders with pomme frites. Madeleines offers a place to sit and feast amongst European antiques or during warmer weather the perfect outdoor sidewalk café seating. Very French! Too busy to linger? They are happy to bundle up your choices and send you out with gourmet to go! And what’s a French café without a superb cup of dark coffee to compliment the luscious pastry! Madeleines features a hand-made state of the art espresso machine artfully used by skilled baristas to serve smooth espresso richness all day long. The exquisite local Doma brand of coffee accounts for the taste! Voila! Once you have found Madeleine's Café & Pâtisserie, mon ami, you have tasted France at its best!